This contributing, largely intact, c.1850, 2-story, wood frame residence retains many Greek Revival/ltalianate period details, although the front, one-story porch has been substantially modified. The cross-gabled configuration features a front-gabled entrance and side­ gabled wing, both of which display decorative cornice brackets, 2/2 pane sash, pilasters, and cornice trim. 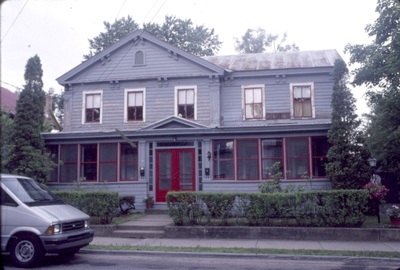 This is a two story, “ell” shape Greek Revival as exemplified by its proportion, fenestration, roof lines and entablature. Also note the corner pilasters on the street gable facade and the lack there-of on the “ell”. Italianate details are demonstrated in the existence of the cornice brackets. The porch is of Arts & Crafts style by virtue of the battered skirt and columns. 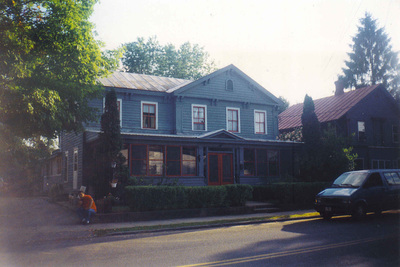 The Queen Village Inn and Tea Room, a boarding house at 14 Hudson Street, was established by Mr. and Mrs. Charles E. Bennett and their daughter, Miss Irene Bennett in June of 1929. They purchased it from Laura Witherell, who operated it as the Witherell House prior to that. Irene married Paul L. Griffin and they continued its operation until sometime after 1961. For the summer of 1930 they advertised it in the Brooklyn Daily Eagle as "clean, airy rooms: home cooking; residential section; 5 minutes to Echo Lake; bathing; $16 and $20 weekly." Irene and Paul's daughter, Caroline, married Donald Langworthy and they eventually converted it to apartments.